Andre Chaperon, Email Marketing Genius and owner of many successful products, include the industry leading Auto Responder Madness. Details Below. On May 29, 2013, Google rolled out a game-changing new feature for all GMail users to filter out all promotional and advertising emails from the main inbox – that is plummeting open rates, clicks, and sales for mail marketers around the world. 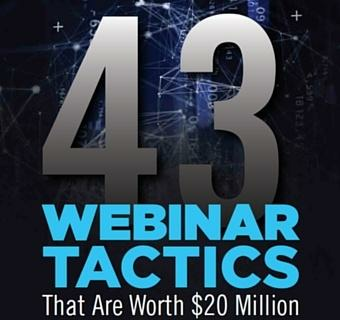 While most marketers are panicking about what to do and are worried what will happen when all their emails to their prospects are sent straight to the promotions tab, getting near-zero opens and clicks…there’s a group of smart entrepreneurs using using this opportunity to skyrocket their email opens, clicks, and sales. This seems like horrible news. but here’s the secret: you have a chance at DOMINATING your industry if you play your cards right. If all your competitor’s emails end up in the “promotions tab” while yours is the only one that makes it into the main tab… then your sales will skyrocket. So how do you get your emails into the main tab for your prospects? The old ways of doing email marketing are already becoming out-dated, as you probably notice yourself from the decline in email open rates, clicks and sales in the last 5 years. We expect that if you are still using the outdated form of email marketing, in the coming months you will not only see declining opens, clicks and sales, but they could drop to near zero. Yet if you learn a simple, fun, exciting way that thousands of entrepreneurs have already used to get up to 70% open rates, 80% click through rates, and 46% of their prospects becoming customers, then RIGHT NOW is your golden opportunity to shoot straight to becoming the leader of your industry, getting multiples more customers and clients, and building a healthy, strong business where your prospects and customers love what you have to offer. I know a lot of people focus on open rates. I never have. In fact up until recently I have still just sent out plain-text emails so it was impossible to even track “opens”. I moved to HTML not to track opens but rather so my emails could be read on desktop and all mobile devices without the hard-return formatting issue. That said, this isn’t about changing minds about whether ORs are a valid and accurate metric. My personal thoughts are irrelevant. If anything, opens are a little higher now. End of the day I could care less what Google or Yahoo! or MSN do. I know the best people will ALWAYS still read my emails. I have people who’ll scream blue murder if they even think they’ve missed an email from me. They don’t care what folder the email is in. They’re looking for MY NAME. Which is the whole damn point. ARM is about relationship nurturing. Over time, through the techniques taught, you earn the attention and trust of an audience. When that happens YOUR NAME is associated with something worth reading. Worth paying attention to. Meaning your “Trust Equity” (™) is elevated way above everyone else. To demonstrate this, people email ME when they think they’ve missed an email. I mean, who does that? 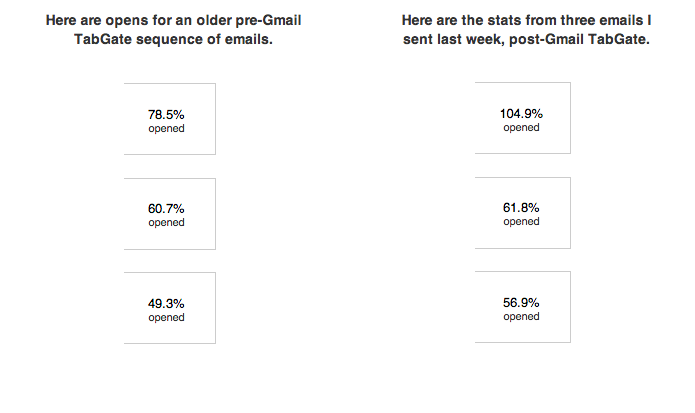 … which other marketer can say that their subscribers complain to them when they think they’ve missed an email? We get “Please resend me Email X” kinda emails all the time. Once we’ve dealt them, we delete the emails. How are you handling the whole new Gmail issue? Seems pretty serious to me and we have done a bit of testing and have not seen a clear way to work around it. He’s stressing out, as are no doubt many other marketers. Told him I’ve not seen any issue. Nothing at all. Everything is behaving just like it used to. If your emails are marked as promotions, all you have to do to get them unmarked is tell your prospect to click “not promotions” on the top-left corner of gmail in the same way Andre tells his customers to white-list his emails by creating a new filter (actually, clicking “not promotions” is even easier). Love emails from Andre Chaperon and as he rightly says I would look for his name if he didn’t appear in my inbox any time soon!